When it comes to high street grooming and beauty, especially when looking at local supermarkets of Boots/Superdrug stores, Neutrogena has to be one of me favourite brands. Their formulations are tried and tested; most often excellently formulated and usually available at a hell of a bargain. 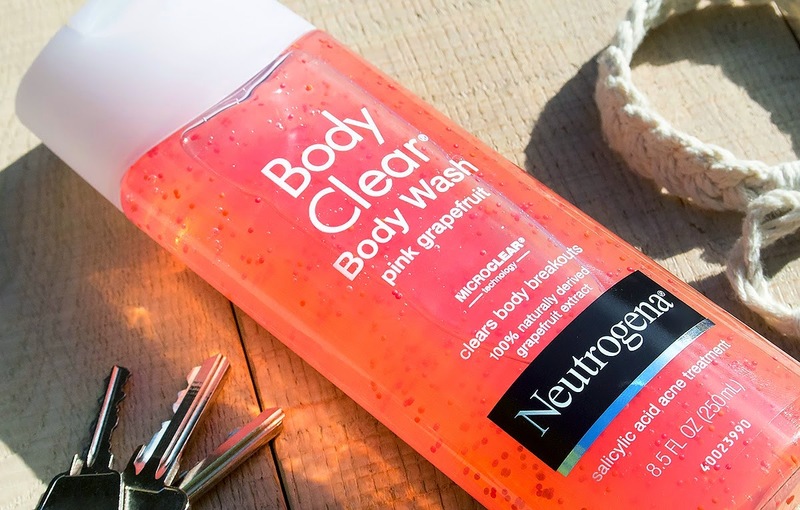 Neutrogena Body Clear Body Wash, a Salicylic Acid based acne treatment with skin tingling pink grapefruit extract is no exception. Unfortunately, it isn’t available on the shelves here in the UK (yet), but there are plenty of stockists and suppliers available on eBay located in the UK to choose from (mine took maybe 2 days to get here and was just over £10). Salicylic Acid (also known as BHA– Beta Hydroxy Acid) is a gentle, chemical exfoliator that’s excellent for acne and spots as you should never use scrubbers and beads which might risk scarring/scabbing. Neutrogena Body Clear Body Wash contains one of the highest concentrations of Salicylic Acid you’d want in an acne treatment, at 2%. There are a few little beads in the mixture and I honestly don’t know why; there aren’t enough to exfoliate at all (you get maybe 3 beads per squirt) and they don’t appear to burst and release anything. Also, you need the tiniest amount of product; I can see a bottle like this lasting for months. Neutrogena Body Clear Body Wash does what is says on the tin. I get spots on my body here and there, particularly ingrowns from shaving and this completely does the job in calming them down; preventing them from occurring in the first place (that was hugely noticeable) and clearing up existing blemishes. It’s been designed to accompany any current medical treatments for acne you might be taking (but always seek your doctor or dermatologist’s advice) and even on its own, doesn’t dry out the skin despite foaming like crazy – also the smell is incredible; of real grapefruit not some cheap and obvious synthetic. If you’re looking for something to treat and correct bodily acne and blemishes, Neutrogena Body Clear Body Wash is 100% the place to start. Now there is the original formulation but from research, this is far superior with Vitamin C, Pink Grapefruit and MicroClear Technology. It’s excellent value, effective and the ingredients are pretty darn good; I can’t fathom why this hasn’t been brought to the UK market yet – it’s not exactly brand new. If you’re looking for something a little more advanced, check out my review of Murad Blemish Control Body Wash on Manface; one of my all time favourite shower products. This article first appeared on MANFACE written by Thom Watson. It was published on Friday 11th July 2014 and was last updated on Monday 3rd April 2017 at 2:00pm. It's categorised under Body, Cleanse, High Street, Neutrogena, Treatment where you'll find more related content. Maybe its the plastic beads which are harmful to the environment! Why this is not available in the UK I can’t understand.